A 360-degree show themed on film and musicals is coming to Westgate. When Music Meets Film is a production designed by Malleable Ltd which will take place at the Westgate Pavilion next month. The immersive cabaret show is not confined to a stage, instead taking place around the audience and even involving them in the performance. Every audience member has the option to have an interactive wrist band, indicating they are happy to get involved with the show. This allows cast members to get close to the individual, even sitting on their lap with their consent. 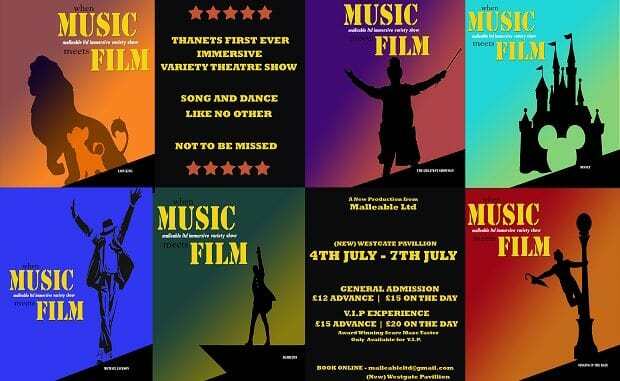 When Music Meets Film will feature numbers from The Greatest Showman and a signed performance of This Is Me as well as the voices from many of Thanet best performers. Choreography is from West End artist Dominic Spin and Thanet events co-ordinator Charlotte Jane-Brooker. When Music Meets Film runs from Thursday, July 5 – Saturday, July 7. Try out the VIP Experience and get a taster of the award winning Scare Maze : Madhouse Margate and the VIP interval lounge. Special offer – message your request for tickets with the word showman here and get a 10% discount.